Have you been joining in with Pat Sloan and Jane Davidson's The Splendid Sampler? Block 6 was released yesterday! 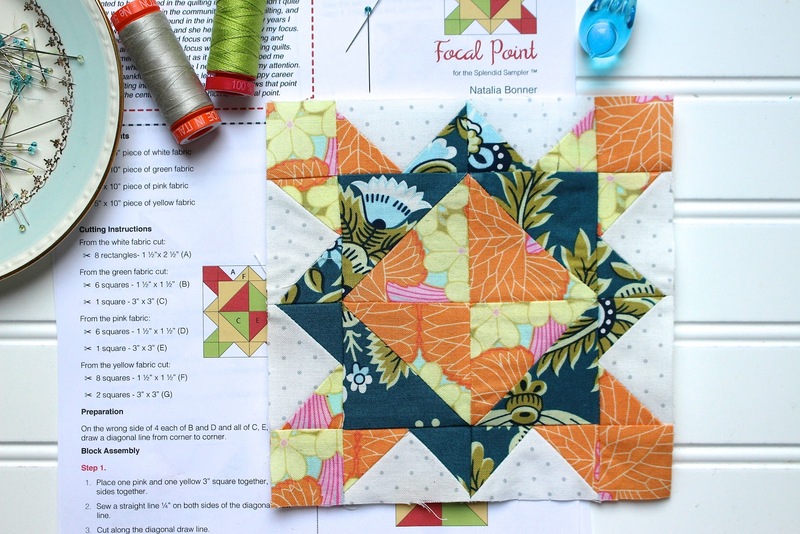 Focal Point is the lovely new free block by Natali Bonner from Piece N Quilt . I did not follow the fabric placement. I was playing around and really liked just the two colors. One of the things I am enjoying the most with the online quilt along is seeing all of the hundreds of variations of just one block! Between the wonderful shared blocks on The Splendid Sampler site and the Facebook group, you can see how this block can work for you with the stash you already have on hand and you can join in at any time! My other must have for all my piecing is Aurifil 50wt! I am out of 2600 ( gasp), my absolute favorite piecing color and decided to use the nice neutral 2310 would work. 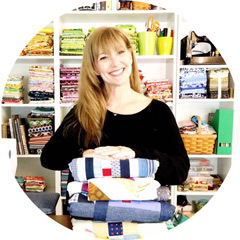 Aurifil 50wt is a beautiful long staple Egyptian cotton two ply thread that is strong and still thin enough to make your seams flat and more accurate. Perfect piecing! Tomorrow I will be cleaning up this mess of this week's ( and the week before) projects! I was sick last weekend so did not get a chance :o( This weekend it is my MISSION to clean and maybe even organize a fun giveaway! Looking forward to seeing your blocks! liking your version, have not done mine yet and given up on block 4. Re seeing the work is it only facebook as that is driving me crazy as there are so many posting on it and cannot get to see what else is happening on other pages of facebook it has taken over completely!